Everything Connected | OAuth, OpenID Connect, JSON Web Tokens | Anvil Research, Inc.
services, and devices to each other and the rest of the world. We're building the definitive identity and access hub. It's the only thing you'll need to connect everything. And it's completely open source. Just a few of the OAuth providers Anvil Connect supports. 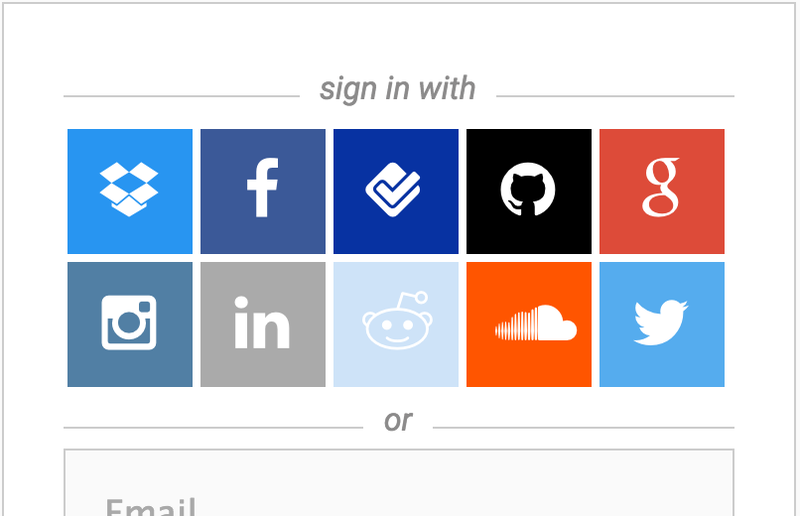 Using Anvil Connect, you can authenticate users with your choice of passwords or countless OAuth providers, right out of the box. Go further and brand the interface with your own design. 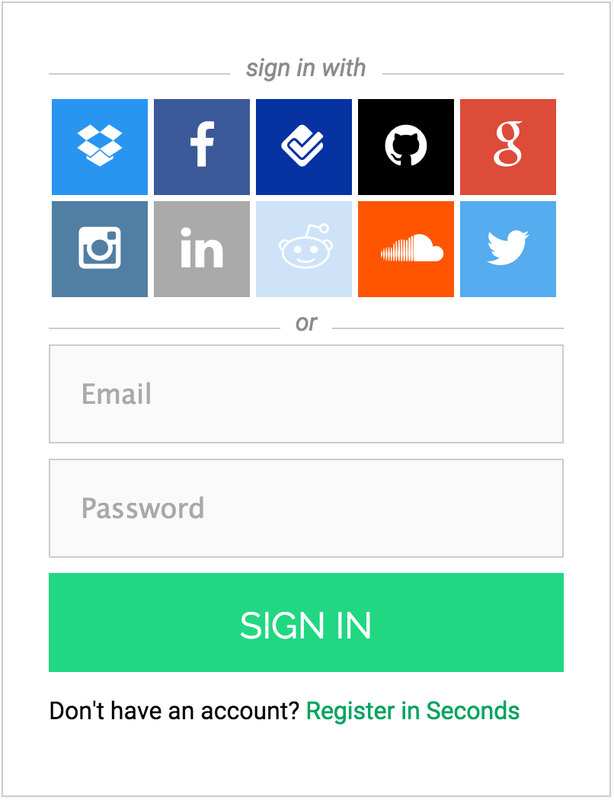 You can even employ a custom auth scheme. Use virtually any existing Passport.js strategy or your very own code. Have more than one app? Your users get a seamless Single Sign-On experience with shared sessions. Apps today rely on all kinds of third party data, but integrating with so many OAuth providers can be a roadblock. With Anvil Connect, you just register with each provider you want to use, install one client library in your app, and start sending API requests. Need to share data securely between your own loosely coupled apps and services? How about exposing it to other developers? Anvil Connect can issue stateless, signed JSON Web Tokens using simple two- and three-legged OAuth 2.0 flows. As you grow, you become the bedrock of an ecosystem. As a federated identity provider, other developers' apps can be authenticated with your users' accounts, extending the reach of your brand and offering incredible convenience to end users and customers. Best of all, Anvil Connect is MIT licensed and 100% open source. You can start using it without breaking the bank, and you'll never have to worry about that SaaS company closing it's doors. We recognize the fact that the impact of infrastructure is leveraged. Our work affects not only our software's direct users, but their users as well. Business continuity and investments in development should never be in jeopardy because of a proprietary dependency. That's why we believe critical infrastructure must be free and open source. Development of Anvil Connect is driven by the people who depend on it most. There are lots of ways you can make a difference, like filing issues, contributing code, chatting on Gitter, joining weekly hangouts, blogging, tweeting, and even helping improve the docs (*cough*). With open source, all things are possible and when we work together, everyone wins. We're serious about open standards and interoperability. Anvil Connect works with any language, platform or framework that can talk HTTP and there are already scores of compatible libraries. Sharing passwords is unsafe. OAuth defines a set of authorization flows that let users securely delegate access to their accounts by third party software. OAuth's access tokens can also be used for client-server authentication where user consent isn't required. This profile of OAuth 2.0 provides strong identity assurances using simple auth flows that work with browser, server, and mobile applications. The specification also supports discovery, dynamic registration, session management, and encryption. Anvil Connect issues identity and access tokens as digitally signed JSON Web Tokens. Signatures provide an exceptionally trustworthy mechanism for verifying authenticity. And with their object payload, JWTs can carry everything needed to authorize an API request. Be sure to have Node.js, npm and Redis installed on your system. Check the documentation for more details. © 2015 Anvil Research, Inc.
There’s no easy way to say this, so I’ll be blunt. During the early weeks of 2019, we’ll be archiving Anvil Connect and all related packages. This code is entirely MIT Licensed. You’re free to do with it what you want. That said, we are recommending against new users deploying it, as we don’t expect to continue development and can’t guarantee maintenance. It’s a long road that led to our decision. Rather than elaborate on all that’s transpired over the past six years, I’ll give you our reasons for setting this down and moving on. First, there doesn’t seem to be a sustainable way to directly fund this work while also strictly adhering to the principles we committed to when we started. We might do things differently from the outset next time, but we won’t break the promises we made our users to remain free and open. The challenge of funding didn’t exactly kill us. We found ways to keep going, even when Top Ramen looked like fine dining. But the leanest times along with an often thankless job gradually eroded our enthusiasm. There’s good reason works of this nature are usually produced as a byproduct of other business, rather than being powered by their own commercial success. But there was a far more substantial contributing factor in our decision. The standards we implemented here – OpenID Connect, JOSE, Web Cryptography API, to name a few – were an advance to the state of the art back in 2013 when we started. Unfortunately, they aren’t well suited to solving the problems that occupy our attention today. The assumptions behind these technologies enable incidents like Facebook’s shameful episode with Cambridge Analytica. Even if we all solemnly swear to use this tech more responsibly, we aren’t likely to move the needle very far on privacy and data protection. Stopping the abuse of identity and private data is likely to become even more challenging in the years to come. After pushing the limits of federated identity, both in the field and across a variety of research projects at MIT, we believe this technology just can’t solve it. The OAuth framework and everything derived from it belongs to a different time and serves a different purpose. For the same reasons we can’t hear voices via telegraphy, see video using AM/FM radio, or stream on demand with broadcast television, we can’t effectively protect private data using these technologies bolted onto the open web as an afterthought. Looking to the future, we believe a blank slate rethink of how private data on the internet should work is both necessary and timely. We almost certainly won’t reuse the code we created here. That’s ok; our perspective has broadened, our understanding has improved, and we need to adapt accordingly. Early in 2018 some members of this community and I formed a new company, Stranger Labs, to pursue new research questions and technical ideas that depart dramatically from the work we did here at Anvil Research. That’s where we’ll be spending 100% of our energy going forward. Given the nature of Anvil’s code, we have a responsibility to either maintain it or bring these projects to a close. Since it no longer serves our own purposes to continue development, we have no good choice but to archive. This is a very difficult step. It pains us – no one more than me – to leave so much of our work here unfinished. More importantly, I deeply regret that our decision may create headaches for some Anvil users. I'm truly sorry for the inconvenience. Fortunately, avoiding the worst problems of SaaS company shutdowns and vendor lock-in were among our reasons for shipping 100% open source code and choosing to implement open standards wherever possible. If you’re in production now or shipping soon, nothing will stop working overnight. And unlike when we started, there are now plenty of good implementations for those needing an OpenID Connect provider. To everyone who used and contributed to Anvil, came to the weekly hangouts, encouraged, supported, and even schooled us along the way, thank you. We wish you the best and hope to have the privilege of serving you again.